How do I know if a hazard is dangerous to my health? What are the main ways to control for hazards? What are some examples of controls? A hazard is anything that has the potential to cause harm. The harm caused can affect buildings, equipment, individuals, or the environment. From an occupational hygiene perspective, focus is placed on hazards that can affect the individual. Physical Hazards Noise, Light, Temperature, Radiation. Biological Hazards Mould, Viruses, Blood Bourne Pathogens, Animal Allergens. Chemical Hazards Acids, Bases, Organic Vapours. To determine if a hazard can result in adverse health effects, monitoring needs to be carried out through either personal sampling or area sampling using specialized equipment. The results from all monitoring are compared to WorkSafeBC regulations or other applicable standards to ensure compliance. If compliance is not achieved then the necessary controls need to be implemented. 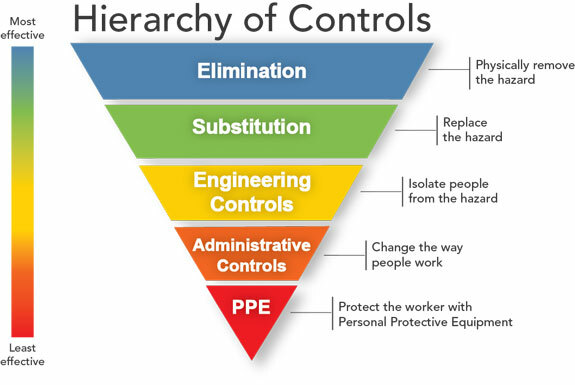 The hierarchy of controls should always be used to eliminate or reduce exposure to hazards. Exposure Control Plans (ECP’s) function to protect staff and students from exposures to hazards by outlining important information regarding that hazard. More information on exposure control plans can be found at WorkSafeBC (PDF). UBC has developed several ECP’s, which can be viewed here.